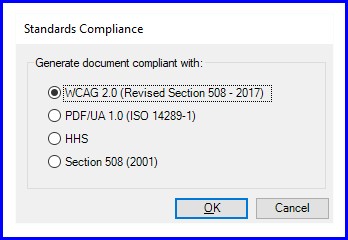 How do I make PDFs from Powerpoint compliant with Section 508? CommonLook® Office is an add-in to Microsoft® Word and PowerPoint that enables organizations to ensure the creation of accessible PDF documents and forms without prior knowledge of accessibility. With CommonLook Office, content authors can immediately begin making high-quality accessible PDF files that conform to U.S. Section 508, U.S. Department of Health and Human Services (HHS), WCAG 2.0, and/or PDF/UA specifications. When CommonLook Office is launched and you choose the appropriate accessibility standard, the wizard then tests the document against that standard. Any issues, or potential issues, are brought to your attention so that they can be addressed prior to PDF generation. After all of the concerns have been addressed and corrected, a tagged, accessible, standard-compliant PDF is created. In addition, a report may be generated to certify that the PDF has indeed passed all of the checkpoints relevant to the selected accessibility standard. The CommonLook Office process involves going through accessibility checkpoints that correspond to the selected standard as well as a number of other key accessibility and usability checks. Choose CommonLook Office in the ribbon. Follow the instructions in the yellow box at the top of the CommonLook Office Panel. If more information is needed for a particular checkpoint, follow the “More” link in the yellow box at the top of the panel. If corrections need to be made to the document, either close CommonLook Office to make the changes or simply make the changes to the PowerPoint document from within the CommonLook Office interface. When making changes from within CommonLook Office, be sure to use the “Reload” button. As errors are fixed, use the Next Task button to move to the next item. Once all tasks for the current checkpoint have been completed, the first task in the next applicable checkpoint is displayed. After all applicable checkpoints have been addressed, CommonLook Office generates an accessible PDF. As previously mentioned, there is also the option to generate a report to certify that the PDF document meets the chosen accessibility standard. To manually run a checkpoint once, in the current document, navigate to the “All Checkpoints” tab (#1), choose the checkpoint from the list (#2), go back to the “Current Checkpoints” tab (#3) and follow the instructions provided. CommonLook Office is designed to guide you through a complete range of accessibility checks prior to saving a PowerPoint presentation to a PDF. You may, however, also choose to address the checkpoints in any order or at any time. Simply choose the checkpoint from the “All Checkpoints” tab and then go back to the “Current Checkpoint” tab to address the concerns with that chosen checkpoint. This procedure can be useful for testing as the presentation is created. For example, you might choose to run the Table checkpoint after inserting a table, instead of waiting until the whole presentation has been completed. 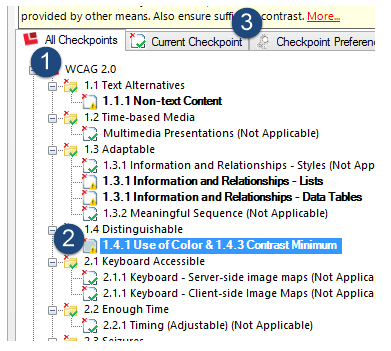 Certain advanced options for the application settings are available by choosing the CommonLook Office Preferences button on the ribbon. Refer to the page on CommonLook Office Application Preferences for more information about these settings. In addition, the checkpoints themselves have options to always run, always skip, or to only be run when applicable. Refer to the page on adjusting checkpoint navigation preferences. As previously mentioned, when opening CommonLook Office, you’re asked to choose a standard to which the PDF should conform. When used properly, CommonLook Office will generate PDFs that conform to U.S. Section 508 (the “Original” standard from 2001), U.S. Dept. 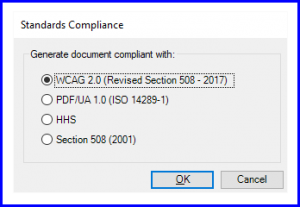 of Health and Human Services (HHS), WCAG 2.0 (AA) – also know as the “Refreshed” Section 508 as of 2017, and/or PDF/UA criteria. Download the accompanying PowerPoint presentation and follow these Quick Start Instructions to get up and running with CommonLook Office in PowerPoint! To assist in creating compliant and accessible PDF documents, CommonLook provides training on the use of our software as well as on using MS Word and PowerPoint with accessibility in mind. Please visit the training webpage for more information.